The key to improving test scores is to have the student take a full-length practice test. Based upon the results, a long-term plan is developed that involves practice assignments, timing drills, and additional full-length tests. The program is reassessed after each full-length practice test. This is why one-to-one is so effective. The tutor only works on the weaknesses for a specific student. The program is catered to the individual student and not a classroom of students. All of this takes place while leading up to the week of the test. It is not ideal to have gaps while prepping. Score improvement occurs after consistently practicing and learning concepts over a long period of time. Before starting a program, a full-length practice test is used as a baseline. The generated report reveals student strengths and weaknesses. For example, on the math section, the diagnostic report can reveal what the student has the most trouble with: radical equations, quadratic equations, slope, linear equations, distance, midpoint, etc. Know the Test – The first step to any prep program is to ensure the student knows the test. This consists of the following: timing for each section, number of questions, directions for each section, overall format, how the test and certain sections are scored, etc. Being aware of these will eliminate surprises and reduce test day anxiety. Most tests in high school classes are usually an hour long. 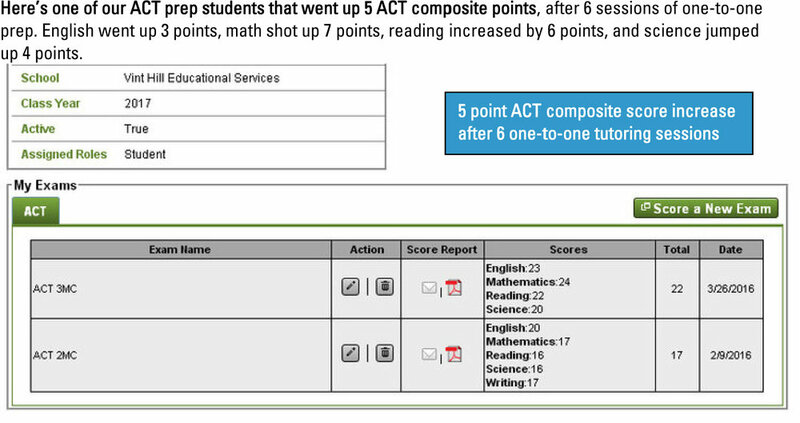 ACT/SAT tests are new to most students and they usually don’t take tests at this length. Pacing – Managing time is extremely important. Students may know the answer to every question, but only make it half-way through each section. Through administering hundreds of practice tests, we’ve seen this to be common. Students should plan on not getting stuck on every single question. Move on if a question stumps you. Regardless of the difficultly level, all questions are worth the same (except the new SAT will have an extended math thinking question). On the opposite hand, there are also those that rush and who do not recheck their work; even when there is ten to fifteen minutes left on the clock. Write, Bubble, and Erase – Each student can control his or her answer. Make sure to bubble clearly when answering. Also, be sure to erase all of an answer. These mistakes are normally careless errors. If a question is skipped on the current SAT, make sure not to bubble in that skipped space for the next question. Knowing where you are on your answer sheet is important. If you do skip a question, put a star next to it and skip it on your answer sheet. You can go back to it if there is time and it helps to remind you that you skipped that question. Always use a No. 2 pencil and write your essay as legibly as you can. The essay should be written on the lines only. The readers won’t see anything in the extra space margins. Make an Educated Guess – The student should answer every question on the ACT and new SAT. On the current SAT, the student needs to choose whether to skip or guess. There is a ¼ point penalty for answering incorrectly on the current SAT. Usually, students should guess on easy to medium questions, if they can eliminate two answers. For more difficult questions, students need to try and eliminate three answers before guessing. Using process of elimination will help narrow down answer choices. With plenty of practice, students can be prepared to excel on test day! The decision to get rid of the penalty for wrong answers was made to encourage students to try their best on every question. The College Board figured that it wasn’t in their best interest to have students decide whether to skip or guess. Losing one quarter of a point for each incorrect answer has a negative impact! The founding documents of the United States include the Bill of Rights and the Declaration of Independence. Today, these documents are still heavily debated in politics and throughout civic life. These important documents are discussed in culture, essays, books, lectures, etc. Vocabulary in these documents can be much harder to understand and students usually don’t see these words on a daily basis. The redesigned SAT reading section will include a passage from a founding document or from a Great Global Conversation. A Great Global Conversation could come from writings from someone of significance. This could be someone like Mahatma Gandhi or Edmund Burke. The questions following the passage will ask the student to reflect on the author’s point, choice of words, and how he or she was persuasive. These questions won’t be marked clearly, but the topics will present themselves in the reading, writing and language, and math tests of the redesigned SAT. The student won’t have to know exact event dates, such as the Battle of the Bulge or the empirical formula for Chlorine gas. Instead, these questions ask the student to apply knowledge and skills acquired in history, social studies, and science courses. On the reading section, for example, the student will be given two history/social studies and two science passages to review. The student might be asked to come up with how he or she thinks the writer came up with evidence, to support a certain conclusion. Regarding the writing and language section, the student might have to edit a passage to include data from a chart, based upon the results of a certain experiment. For the math section, questions will come from a social studies or science background. These questions will be related to college and career work. Questions in the reading section will be comprised of graphics that may be seen in science related fields. Some of them may also focus on certain majors and workplace jobs. On the writing and language section, students will have to do more than just identify errors. There will be edits and improvements to texts that are based on career topics, science, history, and the humanities. There will be questions on the math test that are based on social science and science careers. Some will be hard to tell that they exist and others will be sectioned together. There will be questions with multiple steps and these can be based on real-world concepts. Charts and graphs that are essential to the student in college, career, and life will be included. The redesigned math test will focus on three main areas: The Heart of Algebra, Passport to Advanced Math, and Problem Solving and Data Analysis. The Heart of Algebra will include a focus on linear equations and systems. The College Board wants the student to think in abstract terms. They want the student to master how things relate and don’t relate. The College Board believes that problem solving in Algebra is an important element of becoming prepared to perform well in college and in the workplace. Passport to Advanced Math will include more complex equations. The College Board tests students on topics that are important to master before prepping for advanced concepts. The questions will require students to perform procedural skill in subtracting, adding, and multiplying polynomials. Students may be tested to work with mathematical expressions involving exponentials, integer powers, radicals, and fractions with a varying denominator. The ability for the student to recognize structure is tested. Students will need to solve radical equations, quadratic equations, and rational equations. What is also important is that students may have to play with an equation that contains several variables. The goal would be to single out a quantity of interest. Problem Solving and Data Analysis questions are based upon ordinary situations. These questions could be about tipping a waiter or waitress at a restaurant. Perhaps a student is out at a restaurant with friends and the bill needs to be split a certain number of ways. Ratios, proportions, problem solving, and data analysis is important when it comes to real-world scenarios. The goal of this section is to test the student’s understanding with regard to problem solving. Many of these questions will be set in both academic and career settings. The background will be drawn from science, including the social sciences. Some questions will present information about two relationships. Students will be provided with a table or scatterplot and asked to draw conclusions. The essay on the redesigned SAT will be optional. It will also move to the last section of the test. Previously, the essay was the first section of the test. This will really change things for most students. Students will be presented with a passage and they must explain how the author builds an argument. The essay will double from the current 25 minute time-frame to 50 minutes! The good thing is that only the passage and one sentence in the prompt will change on each administration. This means the prompt will be pretty consistent, but the passage will vary with each administration. Two graders will score the essay, in three areas, utilizing a 1-4 point system. Each score will be on a 2-8 scale for the three areas: reading, analysis, and writing. The student will need to consider how the author uses evidence, develops ideas and claims, and how he or she uses persuasiveness. The student’s essay needs to demonstrate an understanding of how the author puts his or her writing together. This will be a rhetorical analysis dissecting how the passage works. Summarizing what the author has written is not going to work here. Instead, students will explain why the author is writing this piece and what does the individual use to persuade the reader. Students will be required to gather evidence and demonstrate an understanding. Similar to writing a research paper, an individual is showing that he or she interprets evidence clearly. The questions may ask students what part of the text reflects a certain statement. Does the writer do a good job of including information from a chart into the passage? Can information that may not be relevant be taken out of the text? A standard way of doing this, on the reading section, will ask the student to decide on the best evidence for an answer to a prior question. Examining textual evidence will become extremely important. Students will need to identify text from a passage that gives support for the answer to the previous question. The redesigned SAT will test relevant words and phrases. The College Board wants to eliminate rare vocabulary that can be used in limited contexts. Instead, they will test students on common words that are found in college and in the workplace. This is vocabulary that students will use throughout the rest of their lives. Vocabulary expands as students advance through life. This will include vocabulary used in history, literature, and science. The passages will help to provide clues to certain meanings. The redesigned SAT will test words with multiple meanings. This means they may use the word in a passage a bit different from what the student is used to seeing. The context will help to provide certain clues and students will need to be prepared to look for them. It is important to set score goals based upon the student’s baseline practice test scores. You want to set score goals for each section of the test. The goals are based upon the middle 50% scores, for the last freshmen class, to get accepted to a certain college or university. This is why it’s especially important to take a full-length practice test as an initial diagnostic. Not only does it reveal the weakest areas for the student, but it also helps in determining score goals. Another important aspect to taking a practice test is that it will reveal how much prep is needed.